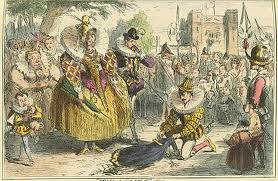 As the myth goes, the explorer (and sometimes pirate) Sir Walter Raleigh once stepped forth from a crowd, gallantly doffed his cloak, and threw it over a mud puddle to protect the feet of the passing queen. This is unfortunately pure fiction, and Sir Walter Scott repeats this old legend in his famous novel "Kenilworth"
'Accordingly, she fixed her keen glance on the youth, as she approached the place where he stood, with a look in which surprise at his boldness seemed to be unmingled with resentment, while a trifling accident happened which attracted her attention towards him yet more strongly. The night had been rainy, and just where the young gentleman stood a small quantity of mud interrupted the Queen's passage. As she hesitated to pass on, the gallant, throwing his cloak from his shoulders, laid it on the miry spot, so as to ensure her stepping over it dry-shod. Elizabeth looked at the young man, who accompanied this act of devoted courtesy with a profound reverence, and a blush that overspread his whole countenance. The Queen was confused, and blushed in her turn, nodded her head, hastily passed on, and embarked in her barge without saying a word." Captain Raleigh found the queen walking , till, meeting with a plashy place, she seemed to scruple going thereon. Presently Raleigh cast and spread his new plush cloak on the ground; whereon the queen trod gently, rewarding him afterwards with many suits. And later he doffed his head. I was born and bought up in North Enfield North London close to Forty Hall House and Estate which was opened as a public park in the 1960's. Forty Hall is a fine Jacobean house built by former Lord Mayor of London Sir Nicholas Rainton around 1629. King James the first's Theobalds is close by. In the grounds of Forty Hall are the remains of Elsynge Palace where Elizabeth and Edward spent much of their childhoods. It is here apparently that they were told of their father Henry VIII's death. Elsynge was within half mile of Enfield Chase a favourite hunting forest of Royalty and close to London. What is interesting from the hill above Elsynge one can look down into the Thames valley and in the mid distance see the City of London with it's spires to capitalism laid out below. Below Elsynge runs turkey brook and where the road crosses there is a bridge called Maidens Bridge! It is local folk history that that this is the site of Sir Walter's gallantry. Certainly the name alludes to Queen Elizabeth. Why is an oral tradition any less valid? I was certainly told the tale as a child. Given the location, history and closeness to both London it is far more likely location than Greenwich. Interestingly some accounts show that Sir Walter Raleighs first son was with a wet nurse in Enfield and an old timber house in Enfield demolished in the 1880's was known as Sir Walter Raleigh's house locally, there is even a postcard! I rest my case. PS Forty Hall is a gem of a gentleman's country estate with gardens, woods, farm and parkland much of it including the house open to the public. Until the 1950's it had been the home of the Parker Bowles's family, of Camilla fame, for over a hundred years. It is well worth a visit. Perhaps if any one knows Andrew Parker Bowles they could as him if he knows of this tale? I agree the oral tales are no less valid. Either way it's a great story. Thanks for such detail of the area. Do u still live there? A history afficionado, devoted to exploring the culture and times of the Elizabethan age.